It is now November and the weather has gotten cooler. Mostly. But anyway, typically around this time of year is when we start to see changes in the foliage toward reds, oranges, and yellows. So for anyone born during this month, the citrine is definitely an appropriate birthstone. It has an amber-y citrus-like color to it that seems to match the colors of the leaves and has an incredible glow. 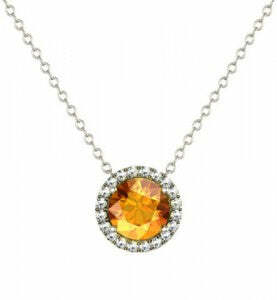 So let’s take a look at some citrine jewelry that we offer. Citrine studs like the above are simple and elegant ways to add a splash of color to your wardrobe and are an excellent way to sport your birthstone. They’re seen here with a 3 prong setting, but they also come in four prong and bezel setting styles with your choice of backing to fasten them to the ear. 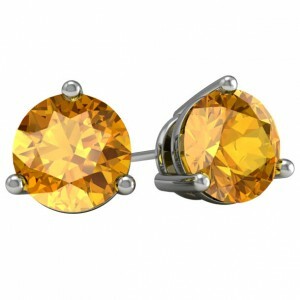 We hope you enjoyed this look at a couple of the citrine gemstone pieces that we carry. If you want to see some more, check out our gemstone jewelry guide.